Today I want to spread some fitness motivation! Why is it so easy to fall off track, yet so hard to get back on? Sometimes a little perspective shift can give you the kick in the pants you need to re-gain that motivation and get going when the going's tough. I personally love quotes. Not the cheesy, cliche quotes that you see all over Google ("No Pain, No Gain" and "Eat, Workout, Rest, Repeat"). I'm talking about the deep, meaningful quotes that make you think. 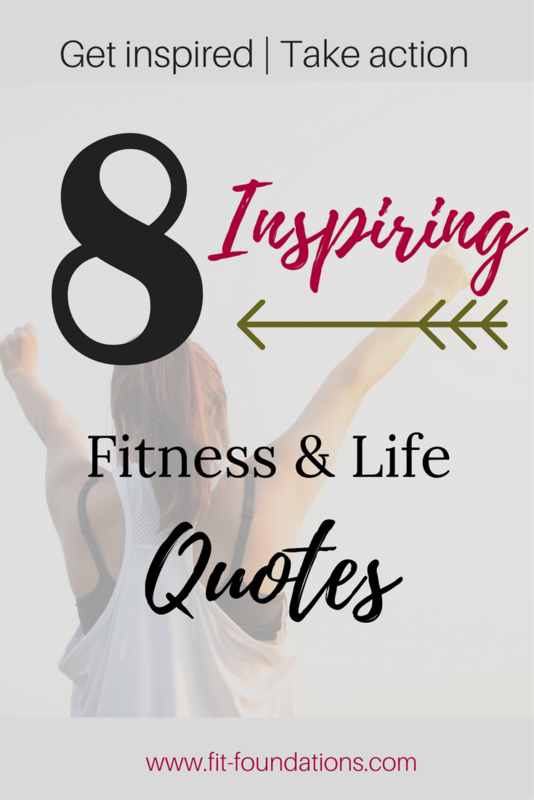 In this post, I will walk you through 8 inspirational quotes to help you gain back (or keep) your fitness motivation. Bonus: They may even inspire you in other areas of your life! Here are 8 of my favorites that reflect my views on fitness motivation and living a strong, meaningful life. I encourage you to pin them or share them on Facebook! Read along for my take on each quote, or skip down to the slideshow! Toss your ego and limiting beliefs to the side. Take a second right now to think about where you'd like to be in your fitness. If you're not there, what's stopping you? Is it a circumstance you can control? If so, YOU may be holding YOU back. Ever feel guilty for that piece of cake you ate and find yourself planning a 2 hour workout to burn it off? Exercise should never be a punishment. Not everyone has the ability to exercise and move their body so, if you do, be grateful for that and take advantage! "I AM" statements are so powerful. What we think is possible, is totally possible. Instead of hoping for something, believe it's possible and true already. Fill in a word with meaning to you. I Am Strong. I Am Happy. Similar to the quote above - what you think, you believe. Program your mind and be conscious about what you're thinking. If you tell yourself you'll always be overweight, it'll likely be true. Living a life of resrtiction isn't the greatest place to be. When you have a goal in mind, write down 3 things you will gain by achieving it. Try not to automatically feel bad about what you're giving up (sugar, soda, etc.). I listened to a great podcast where a man named Jim Fortin was talking about how most people operate on the "Have. Do. Be." mindset. Unfortunately this means most people wait until they "have" something in order to "do" or "be." Let's say you want to be happier. Instead of waiting to have a new job to be happy... be happy and do what you need to do to change your situation in order to have what you want. Knowing it's OK to rest might be one of the most important skills. Often we go, go, go until we have no choice but to take a long-term rest (or quit). Take time along the way to fill your cup and do things you enjoy. Your to-do list or goals will be waiting for you, so don't give up on them. Did you gain something from this post? Were there any quotes that specifically rang true for you? Anything you would add to this list? I would love to hear your comments below! If you liked this post, give it a share on Pinterest or Facebook. I would be so grateful!